During the winter months, it is always a good idea to consider caravan storage. Redlands CA self-storage facility, Vines Storage, offers self-storage for caravans and other recreational vehicles that may need to be housed in an indoor facility when not in use. During the off season, it is always a good idea to make sure that you take care of everything you need to in order to ensure that the caravan is in proper working condition the next time you're ready to take it out for vacation! By taking great care of your caravan each season, you can ensure the life and longevity of your recreational vehicle! Before you store your caravan, it's a good idea to empty anything inside. Remove clothes, furnishings, food, and anything else that could be perishable or could be affected by temperature changes in the caravan. Open all cupboards and drawers to allow ventilation. Make sure all windows and doors are closed and locked, and close the blinds or curtains. Oil any hinges to make sure that they won't squeak and be resistant come springtime. Many caravan owners place pest traps throughout the caravan to ensure that unwanted guests don't make it their home during the winter months. It's always a good idea to drain all the systems, as per manufacturers' recommendations. Change the oil and drain the water system before storing the caravan in self-storage. Additionally, make sure the tires are properly inflated, and remove the battery to take home for regular charging. 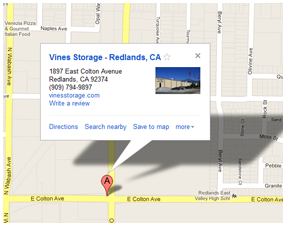 Caravan storage in Redlands CA is easy with Vines Storage. If you are interested in learning more about your storage options at Vines Storage, give us a call, and feel free to ask any questions that you may have about properly storing your vehicles and personal belongings in our facility. Our facility provides many amazing amenities for recreational vehicle owners, such as purified water, air, a dump station, wash bay, and ice, in addition to video surveillance, convenient access hours, and secured entrances. Other area storage facilities are unable to offer these amenities at such an affordable price!